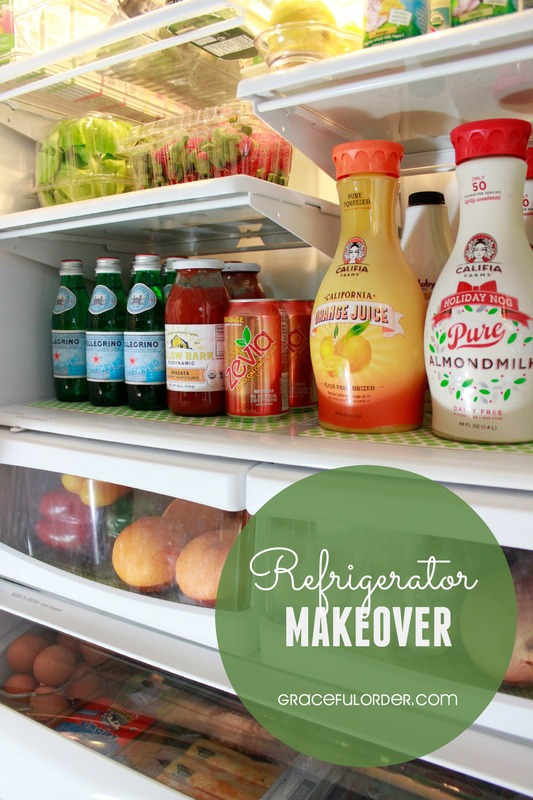 Our Home Organization challenge begins today, and we start with a refrigerator makeover and a giveaway! Double yay! 1. Empty the refrigerator and throw away expired food. I emptied it out the refrigerator which was a good opportunity to sort and group like items on the kitchen table. 2. 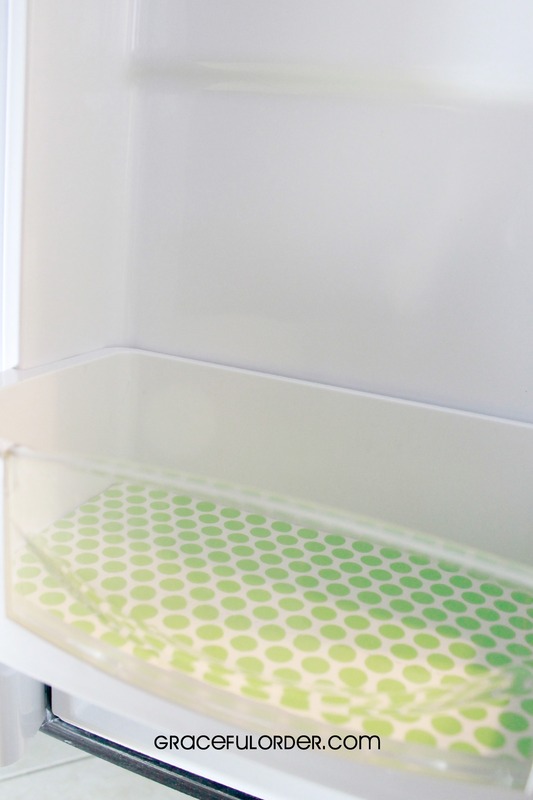 Give the refrigerator a thorough cleaning. 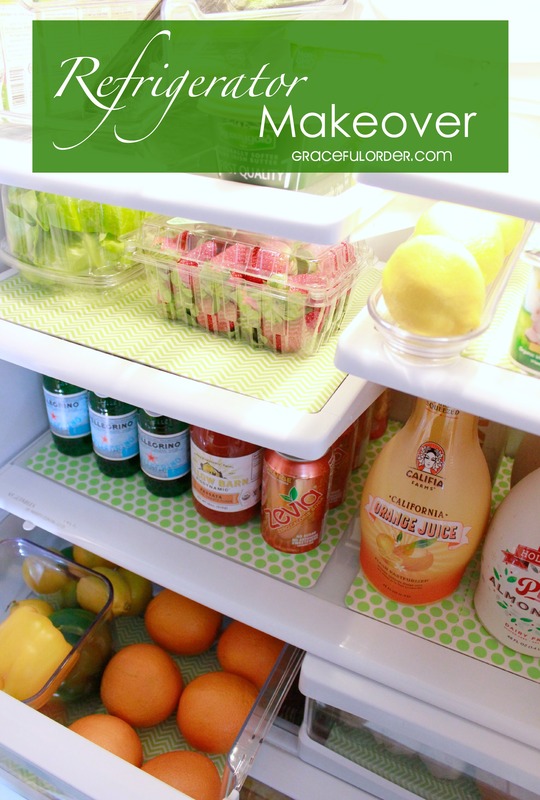 I was so ready to get my fridge looking good again! At this point it needed more than just organizing, it needed a good thorough cleaning. I removed and washed all the shelves and drawers and also cleaned the refrigerator walls. 3. Add coasters and/or fridge bins to the shelves. Then I added a new pack of Fridge Coasters. I have shared with you in other posts how much I love them! They have different patterns and colors – this year I chose green. 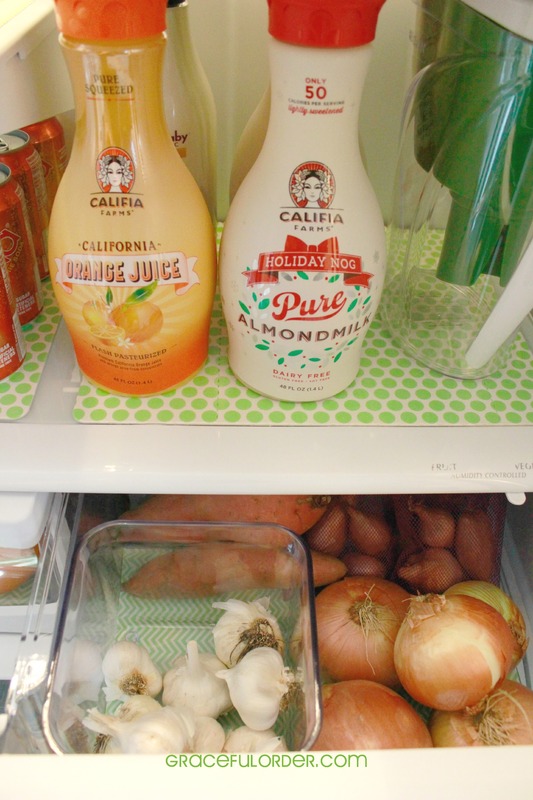 They will help to keep the refrigerator clean by soaking up any spills. After adding the coasters, I added all the bins that I use to corral items. Some of my bins (like the one in the picture below) are simply OXO bins without a lid. 4. 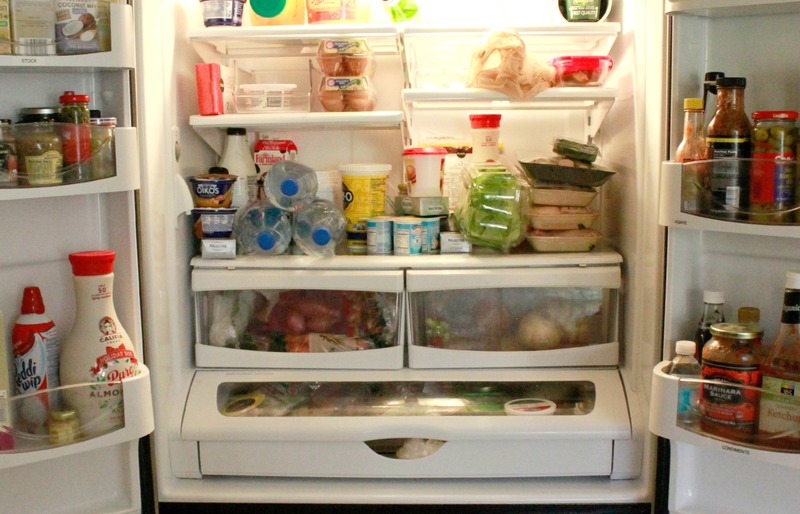 Place the food items back in the fridge. The fun part, add the food and drinks back in the clean fridge! No more expired salad dressings. I may or may not have over done it purchasing butter for holiday baking. I keep asparagus in a wide-mouth sturdy cup and I add a little water. It lasts way longer than if I kept it in the veggie bin. It doesn’t matter where I keep the milk, it doesn’t last more than a few days around here. I love to re-position the shelves to accommodate the groceries. This really narrow shelf is for yogurt. 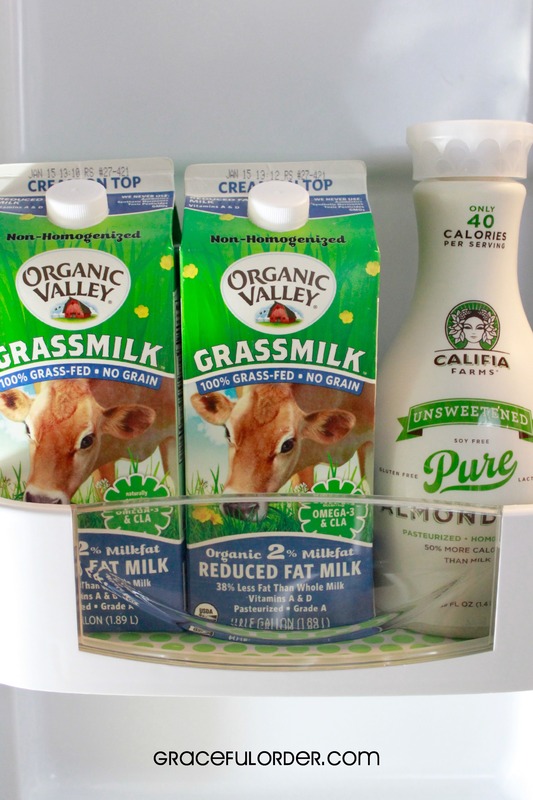 I don’t like to crowd the very top shelf of the fridge so that air can still circulate freely. Although I love fridge bins and I am linking them HERE , I suggest that you only purchase bins for items that you always buy. 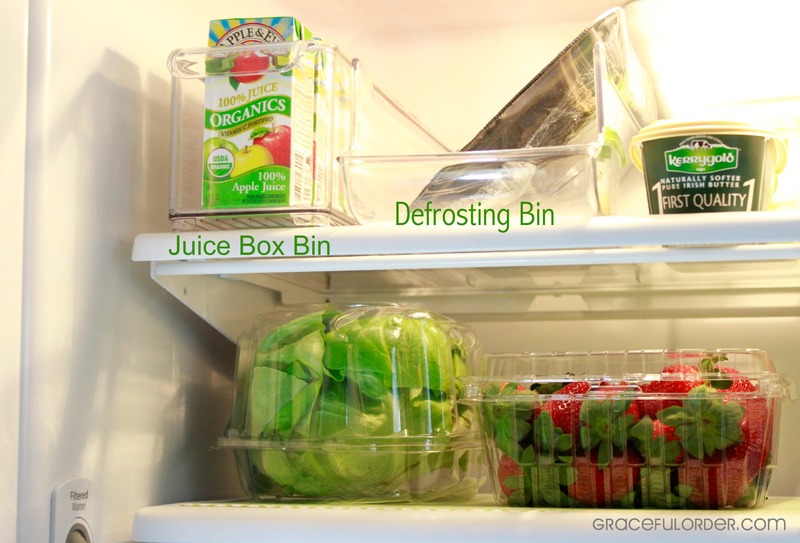 If you never buy juice boxes or yogurts then you don’t need empty bins taking up space in your refrigerator. I also keep an open bin to place whatever I am defrosting for the following days dinner. 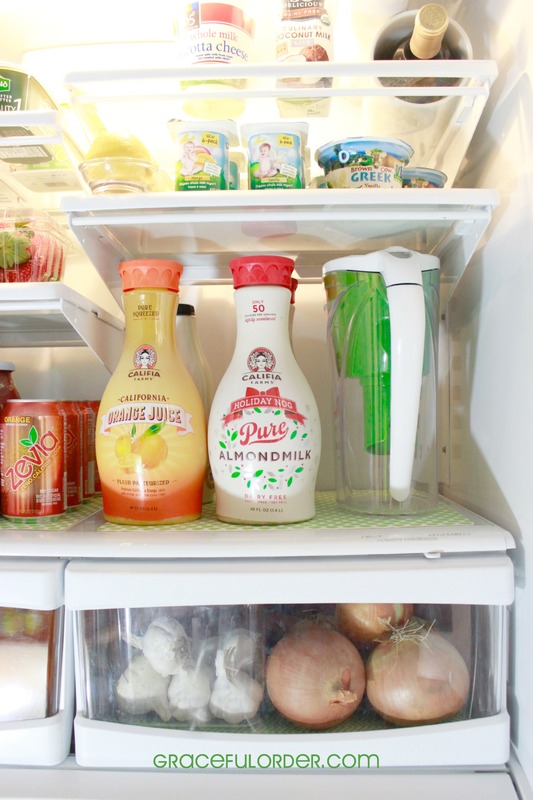 This avoids spills and keeps the fridge clean. Adding just one bin to this drawer keeps onion or garlic skins from taking over the bin and helps to keep veggies separate. Let’s not forget the large sliding drawer. It is my favorite part of french top refrigerators (my least favorite part being the freezer section). This is where I place the treats for little ones since the height it perfect for self-serve. I use this container for the eggs which comes with a lid but I rarely use the lid since we buy so many eggs. You can find a slightly larger one HERE . So maybe for the next 19 seconds my fridge will be sparking and full of perfectly arranged bpa-free bottled waters that always face forward. Until the boys realize that I have replenished the fridge. At least I have the pictures to remember it by! But really, aside from the direction that the bottles face it is easy to maintain a refrigerator when everything has a designated spot. 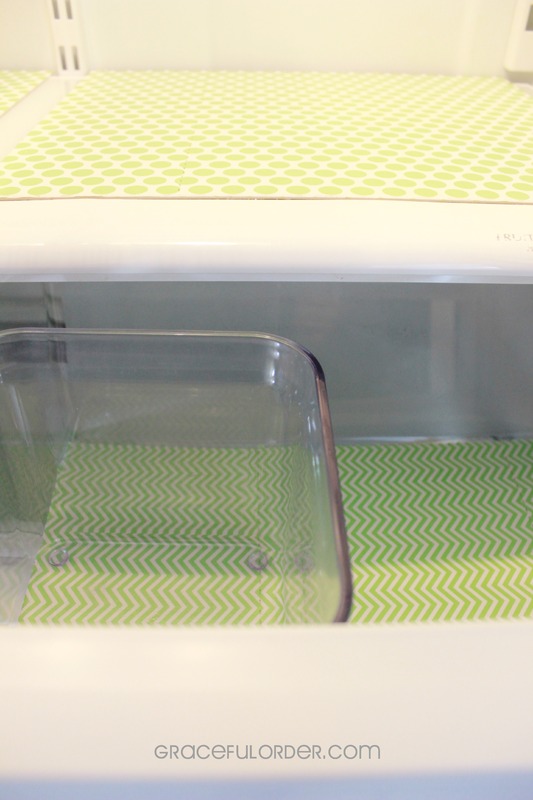 If you like the fridge coasters, then don’t miss out on the giveaway below! Two Graceful Order readers will be given 2 sets of their choice..all courtesy of Fridge Coaster! The giveaway will end at 12 a.m. January 16th. Good luck to all of you and Let’s Organize 2015! ~ Graceful Order’s disclaimers and giveaway regulations can be found “here”. This posts contains links, a few are affiliate links. As always, thank you for your support of Graceful Order! The pantry is by far the toughest. I have a 13-year-old who likes to graze. I am the condiment queen. 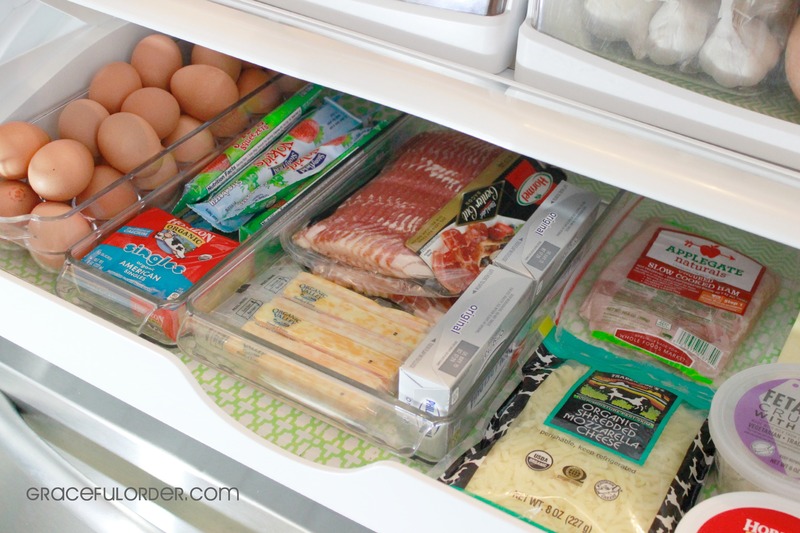 I love a organized refrigerator even though it’s a constant battle to keep it that way. Looking forward to trying the bins and coasters! I’ve always wanted the coasters! I love a clean & organized fridge! I love the designated defrost bin. I always add a mis-sized glass dish in at the last minute and never get things to fit right. 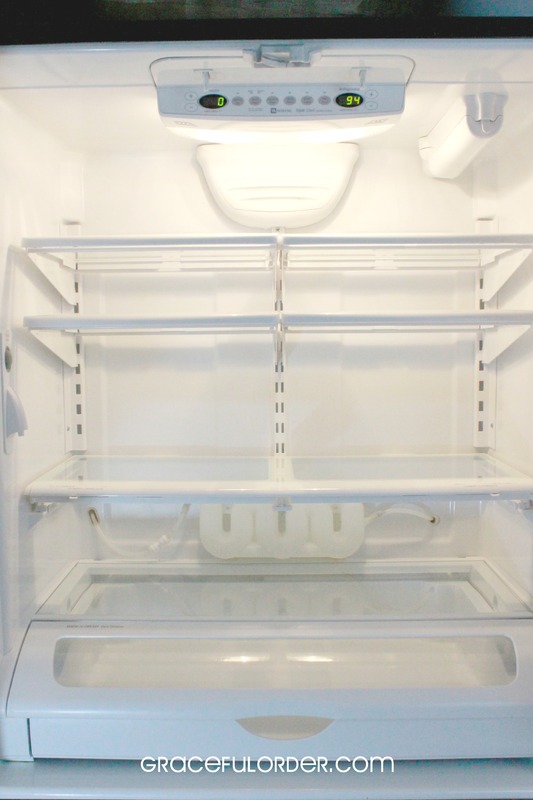 Don’t you always feel so proud of yourself when the refrigerator is freshly clean? I keep opening the door just to look at it. These coasters are new to me, are a great idea, and make things look good, too. Yes, I love opening up a clean and organized refrigerator! 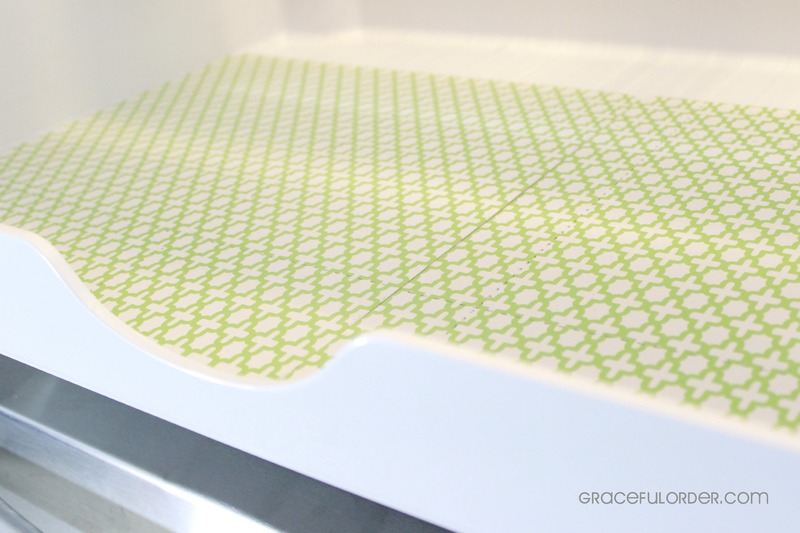 I started using the fridge coasters about six months ago and I love them! I still struggle with two ‘junk drawers’ though…piles of papers and ‘stuff’ that I cannot get on top of, and of course, the fridge, even though I have pretty coasters! We will organize the kitchen drawers in a few days! I have not heard of refrigerator coaster until now. I would love to try them out since it seems everyone who does loves them. I think the hardest area to keep clear is my kitchen table. It seems to be the catch all for anything! My “condiments” side drawers — a mess of toppling over stuff! 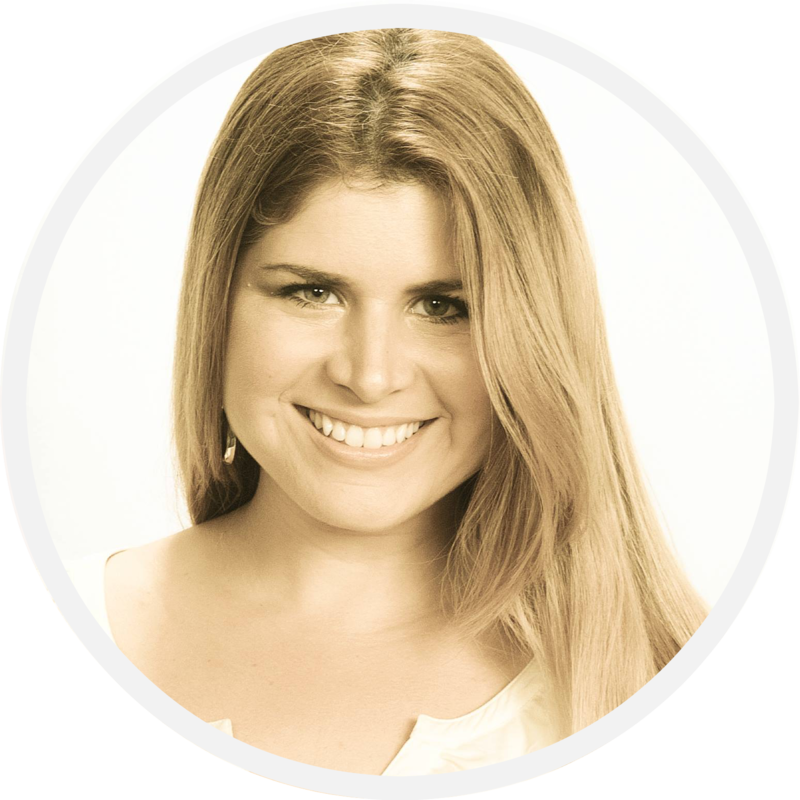 I love your make over! The refrigerator is definitely the worst place in my kitchen. It is more than 20 years old and in an awkward to open location. I love the neat look of the coasters. I would love to try them out. 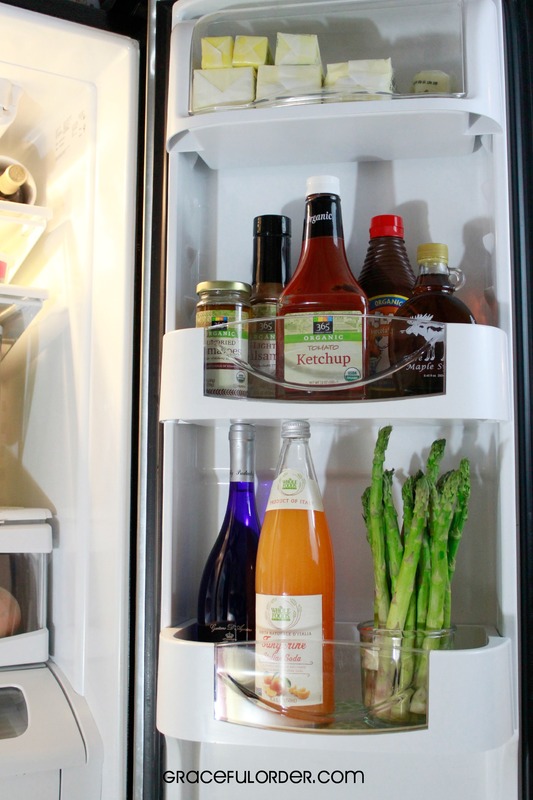 Your organized fridge looks awesome. Why do you refrigerate onions, garlic, shallots, and potatoes? They do not need to be, waste of space. Just curious, have seen others do that as well. If I need the refrigerator space, I just place them on the countertop. If I need the counter space, then I store them in the fridge. I go through these items pretty fast so I don’t worry to much about having them spoil. Love a neat fridge and it’s at times so difficult to keep up with everything! The coasters are so cute and so much easier to take out and clean—great idea. My Refrigerator definitely needs a good cleaning after the holidays. Thanks for the post! I don’t think you are suppose to refrigerate onions or garlic?? Thank you for your comment! I don’t do long-term storage of onions or bulk produce so I just keep them where I have the space. If I need the refrigerator space, I just place them on the countertop as they do not need to be refrigerated. I have heard that it makes them spoil faster to refrigerate them but since I use them often, I have never had this happen. 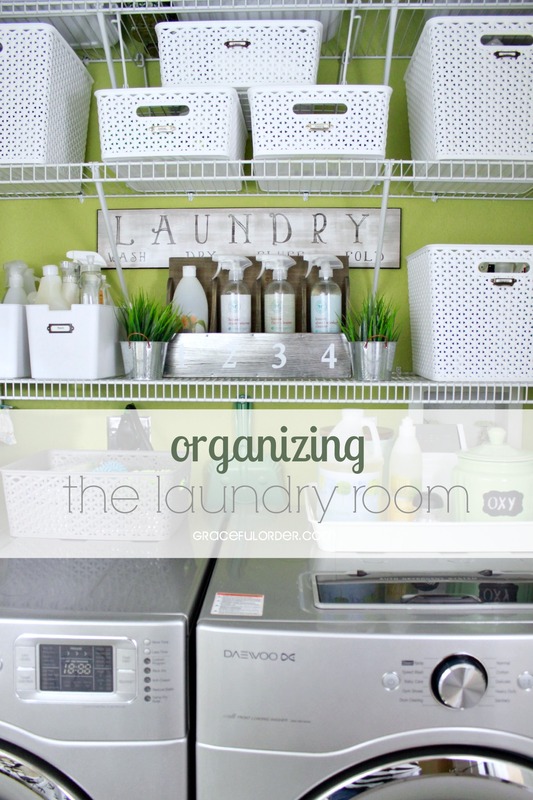 When it comes to the Kitchen, I can’t seem to ditch counter paper clutter! The toughest is everything…I like in an apartment with three other girls so it’s not just me buying the food so it is NEVER organized..or very clean, for that matter. 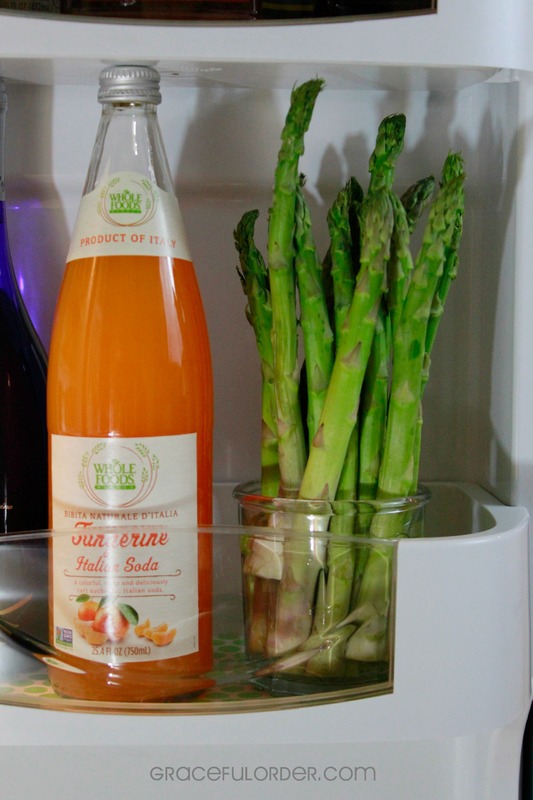 Not sure where to begin to make our fridge look this nice! But I will save all these ideas for when I finally have my own space. Thanks! It is definitely more difficult to keep organized when more than one person puts away the groceries. 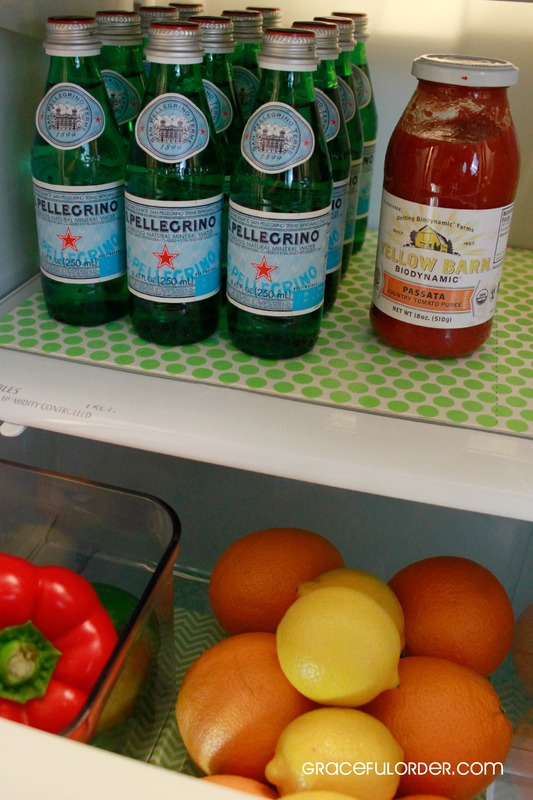 When you have your own space, you will have the prettiest fridge. “Pantry” is tough because it’s a big cabinet, instead of an actual pantry “room”. I have a hard time keeping the sink (inside and fixtures) looking clean and sparkling. My fridge is the hardest to keep clean, although I regularly clean it. The hardest part of my kitchen to keep clean is a tie between the refrigerator and the stove top. I love the way your fridge looks. It is a simple solution, but one I never seem to take the time for. Just cleaning and adding the “coasters” makes it look lovely ! Hardest part to keep clean is sink. Not 5 minutes go by before dirty dishes appear! I love the idea of a defrosting bin. I’m going to have to try that! The counters! It drives me nuts how things just accumulate. The fridge is my project this weekend! I have so many spices! It’s difficult to keep those tidy. I love the fridge coasters and have wanted some for quite a long time. For me, the toughest area to keep clean is the cabinet tops. We tend to accumulate things on top of them. I would say the toughest area for us is the stove! It is black, and sometimes you don’t notice the crumbs that fall below the grates. My toughest area is the tupperware cupboard — always in disarray! Definitely the refrigerator! 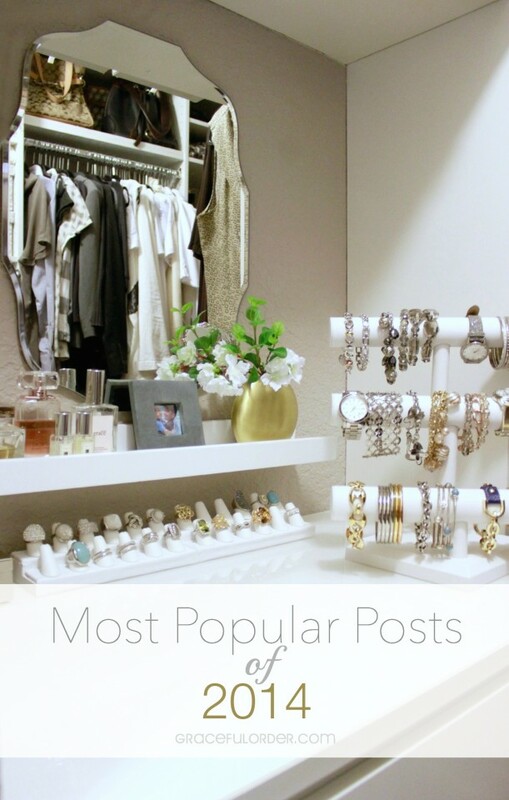 It just seems to draw clutter! Keeping my dishes under control is the hardest thing for me! The toughest place for me to keep tidy is our drawer full of miscellaneous items, like measuring spoons and a peeler. Sooooo pretty! Love a freshly cleaned and organized fridge, even if it only lasts a few seconds or minutes! My kitchen counters seem to stay cluttered. Definitely the hardest kitchen area to keep clean. My kitchen island. It’s where the mail goes, the groceries go, the catch all for everything. Ah! My fridge… 3 kids and a husband!!! I have a hard time with our side by side fridge-especially the freezer! It’s so hard to see what we have in there! My side by side fridge/freezer is always a mess. No matter what I do to it things always end up in a jumble. My refrigerator always looks like a disaster hit it. My pantry is hard to keep tidy. cabinets that store storage containers for food, so hard to keep organized. the fridge for sure is the spot that gets the messiest. I have a problem with the counter top clutter!!! The sink is the hardest for m e to keep clean! It’s hard to keep my freezer organized! I’ve been working on my fridge, boy those fridge liners look awesome. They would look great in my Fridge organizing process.